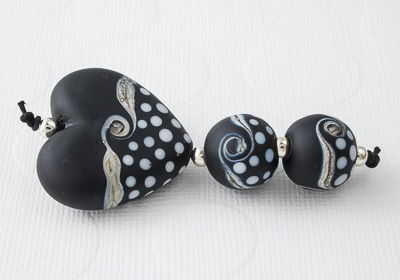 I have been making lots of lampwork hearts at the moment as the shape is interesting to work with and, well, who doesn’t like a heart! I also have to think about what decorations I can apply to such an irregular shape. I particularly like them when they’ve been in the stone tumbler (like the two sets below), but I have to make the beads as smooth as possible first, otherwise the beads end up with shiny patches where the stone tumbling can’t reach. 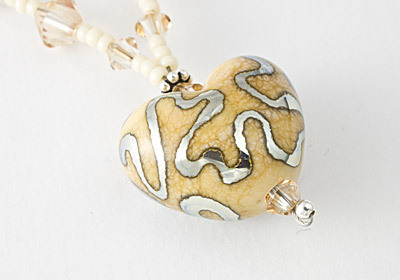 I finish these shiny areas gently with a bead reamer and put them back into the tumbler again to improve the finish. 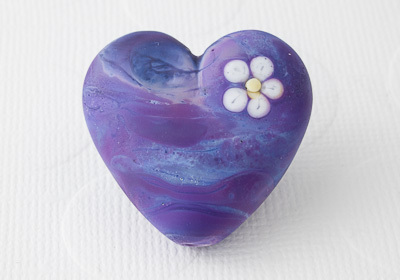 Spots and swirls work really well on a heart shape, or just applying simple sweet flowers to them can make a simple statement and doesn’t detract from the purple swirly shades in the lampwork heart as in the picture above. Alternatively, wiggling Double Helix Helios over dark ivory gives a lovely effect as you can see a dark line where the two glasses touch. There are just so many possibilities to play with, I don’t know what to try next!